All of this feels rather unfamiliar, there’s no denying it. Get in, push the oblong black plastic “key” into a slot illuminated by two green LEDs. Put your seatbelt on. Put your right foot on the brake. Press the start button. Wait until the word “Ready” appears on the digital dashboard, accompanied by two beeps. Press the eerily unresisting transmission lever into “D”, watching for confirmation on the dash, and then let the lever spring back. Release the foot brake with your left foot. Grasp the small, thin-rimmed steering wheel. And you are finally ready to move off in a still silent Toyota Prius. You soon get used to it, of course, but the bizarre starting procedure underscores that you are driving something out of the ordinary. Even compared to the Honda Civic IMA hybrid we drove earlier this year, the Prius feels off-planet. The controls offer a lot less feel, and are much more switch-like. Partly that’s because they are switches: the throttle and brakes are entirely fly-by-wire electronic controls, giving progressive instructions to the on-board computers that do the actual driving. On the throttle side, the black boxes have to decide when to fire up the engine, when to run silently on batteries alone, when to charge the cells from the engine, and when to ask the engine and motor to join forces to hit the Prius’s impressive 10.6-second 0-60 time. Famously, the Prius’s central touch-screen console can display an animated graphic showing energy flows between the engine, wheels, batteries, and the motor that doubles as generator for regenerative braking. This depiction is compelling (and possibly distractingly dangerous) for the first few miles. Thereafter it starts to seem a bit silly and is best ignored: the driver doesn’t need to know or to think about the hybrid’s workings as the car simply gets on with making the most efficient use of the available energy. The Honda’s simple charge/assist bar graph and battery meter is almost as informative and just as irrelevant. Despite the fancy graphics, the Prius’s dashboard is not too keen on divulging the normal details that a driver might expect. There’s no rev-counter, no temperature gauge, and no instruments visible through the steering wheel. All of which serves to reinforce the feeling that the Prius is not really a car at all but some sort of living-room on wheels. But it is a car, albeit not a very fast one. A strip of LED displays below the windscreen offer a numeric speedometer, a visual reminder of the current transmission selection, a bar-graph fuel gauge, and warning lights. There’s something optically odd about their presentation, too – almost like looking at a 3D photograph, the speedo figures float towards you in a way that makes your eyes hurt a bit. The rest of the dash is remarkably free of buttons – almost all of the minor controls are accessed through the central touch-screen, with the most often used functions duplicated through conventional buttons on the steering wheel boss. On the move, the Prius’s clever hybrid mechanicals cycle through their various configurations with remarkable frequency and uncanny smoothness. The biggest difference between the Prius and the Civic hybrid set-up is in the balance struck between electric and petrol power. In the Civic, it’s a little-and-large combo, with a powerful 1.4-litre VTEC engine and weedy 20bhp motor. In the Prius it’s a partnership of equals, with both motor and engine peaking at about 70bhp - although never at the same time. This difference in philosophy is obvious on the road. In the Civic IMA, the engine runs almost all of the time, with the motor joining in when required. In the Prius, you tend to set off on electric power alone, with the engine joining in only when you’ve built up a bit of speed. The Prius seems to have the better set-up. Although the two cars cost about the same to buy and to run, the Prius has a more frugal combined-cycle mileage figure than the Honda, and our petrol costs bore this out, with the Prius beating the Honda by about 5mpg over similar routes and similar driving styles. The mileage benefits depend not just on driving style, of course, but where you drive. Slog up and down motorways and a hybrid is a pointless exercise as it defaults to petrol power almost all of the time. To benefit from a hybrid you really need to spend time in traffic jams, or rushing from one traffic light to the next, depressing as that may seem. In this mode the batteries see a lot of use. Taking things a step further, you can disable the engine and use electric power alone with the Prius’s no-engine “EV” button. However, this results in a driving mode that is too slow and too short-of-range to be of any practical use. Both the Honda IMA and Prius have their merits and drawbacks. Keen drivers will prefer the Honda. 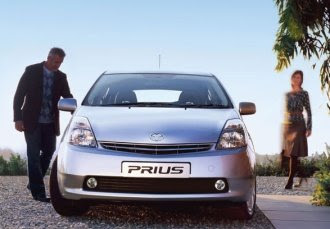 Practical people who want a roomy car to get from A to B as efficiently as possible with minimal fuss will prefer the Prius. We liked them both. But then we would.